Registration has 2 steps: 1) Fill out the form below 2) Set up your bi-weekly donation of $5 or more. Scheduled donations can be cancelled at any time. Active bi-monthly donors are eligible for each regular season month's thank you gift. I want to follow Jesus and His ways and help the disc golf community flourish. 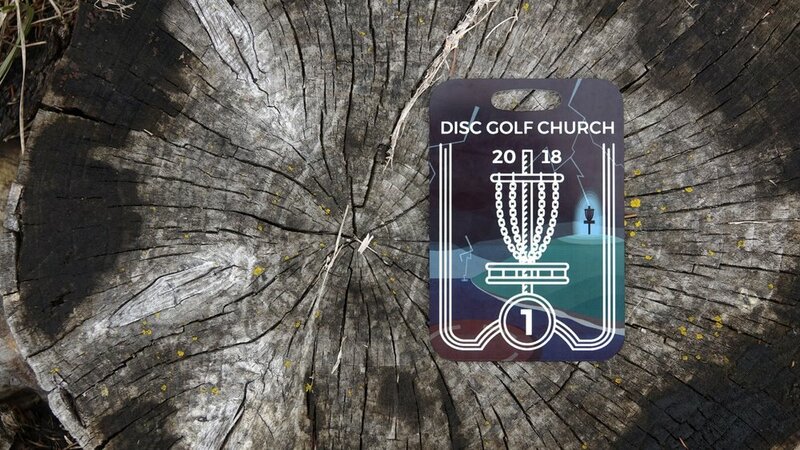 I stand with Disc Golf Church and this purpose. 2) Set up your bi-weekly donation of at least $5. 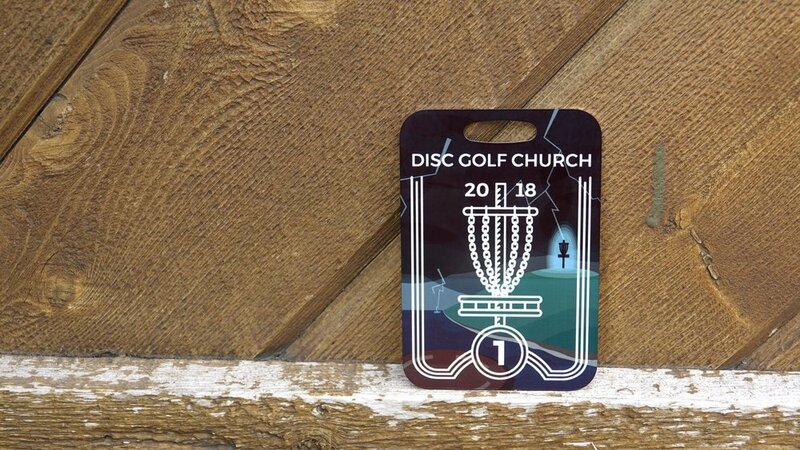 Pick up your tag at the next Disc Golf Church event. New tags are distributed on a first signup plus first pickup basis by the lowest available tag. Players applying for tags before any event has begun will be issued the next available tag and can begin to play for tags. If a player signs up for the bag tag club after the event has begun, they must wait until after the event is over to receive their tag, which will be the highest new tag available. They will still get credit for the round played. Players who are not playing for tags may participate in any event except the Championship on their own cards. The 2018 regular season runs from May 1 through October 31, 2018. 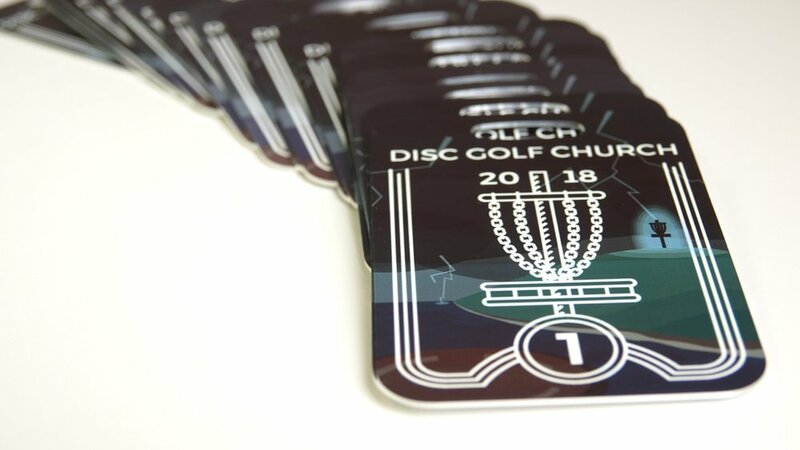 Your donation helps advance the mission of Disc Golf Church and funds prizes, ace pools, and thank you gifts. Learn more about giving here. Out-of-bounds rules must be agreed on by all parties before teeing off. Each player must have their tag at all times. Tags must be plainly visible and can not be hidden. The winner of each card at a regular Disc Golf Church meeting event receives immunity and does not need to accept challenges for 1 week. The player may still challenge lower numbers while holding immunity. Ties are won by the holder of the lower bag tag at the beginning of the round. However, if all players agree before the round starts; a play-off hole(s) can be used as a tiebreaker using sudden death rules. Incomplete round: If a player does not complete a bag tag round, the exiting player should trade tags with the player with the lowest tag number being played. If play is stopped by all players before the round is complete, no tags are exchanged. This could be due to hazardous weather, physical emergency or mutual agreement. Only tag holders can win prizes in tournaments. Players applying for tags before the tournament has begun will be issued the next available tag and can begin to play for tags. If a player decides to join the bag tag club after the tournament event has begun, they are not eligible for prizes and must wait until after the tournament is over to receive their tag, which will be the highest new tag available. Players who are not playing for tags may participate in the tournament on their own cards. Tags at events and tournaments are competed for by cards. Each card of adjacent people play against each other and tags are distributed by score at the end of the event or tournament. Sudden death will decide all ties in tournaments. Players using different tees in tournaments are competing against only other players using the same tee format. Each player must complete 5 events and three challenges against different players to win prize positions at the Championship. The Championship will be divided into a lead card and a chase card. The higher tag challenges the lower tag. The easiest way to challenge is to use the Group Roster to find out who has the lower bag tag and then call them out on the challenge on the Disc Golf Church Facebook Group. Challenges can otherwise be made by phone, social media, email, or in person. In order for Disc Golf Tag to work, all challenges must be accepted. Players who win events have 1 week immunity from challenges. The challenged player picks the course, tees and format. Format choices include: stroke play or match play. The challenged player must give the challenger two (2) times to meet in the next two (2) weeks. If the challenger can not meet that timeline, the challenge is void. Not showing up for a match results in a forfeit (10 minute leeway). Each player is responsible to adding 1:1 Challenges to the "total rounds played" column on the Group Roster. End-of-season recognition will be given for highest rounds played. Back-to-back 1:1 challenge rounds are allowed if both parties agree. After a time has been agreed upon with the challenger, players may invite adjacent tag holders to join to play as a group 1:1 Challenge which is played by event rules. Only directly adjacent players can be on the same card. All rules and guidelines above are subject to change as needed and are not official unless posted on this site. Last updated 10/07/2018.